Last week, the U.S. House of Representatives and the U.S. Senate Committee on Finance each passed a version of a tax bill that would increase the budget deficit over the next decade by $1.5 trillion and $1.4 trillion dollars, respectively, largely as a result of massive tax cuts for corporations and the wealthy. Among other negative impacts of the bill, it could cost Western states $1.3 billion annually in federal oil, gas, and coal payments—funds those states use to pay for roads, schools, firefighters, and other public services. Under a budget law known as the Statutory Pay-As-You-Go (PAYGO) Act, if Congress passes a law that has costs that are not paid for, the federal government must implement mandatory cuts, called sequestration cuts, to certain federal programs to offset those costs. On November 15, the Congressional Budget Office informed House leaders that their tax legislation’s cost would trigger the automatic elimination of a wide range of federal programs, including funding for mineral leasing payments to states. 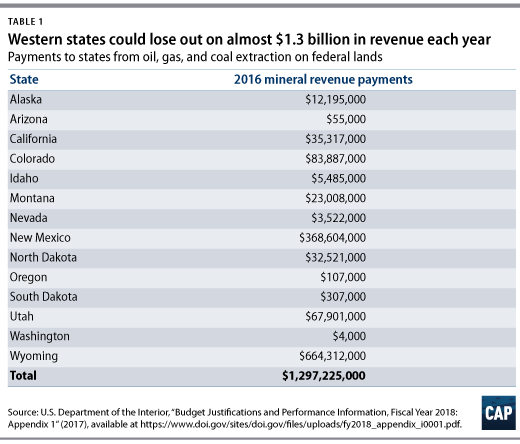 Currently, all revenues from oil, gas, and coal extraction on federal lands are evenly splitbetween the U.S. Treasury and the state where extraction occurs. The one exception is Alaska, where 90 percent of revenues from mineral leasing on federal lands in the state are directed to its government. State governments use these revenues to help pay for infrastructure, education, and public safety, among other things. In 2016, Western states collectively received approximately $1.3 billion in federal energy payments. Without these funds, state governments would either need to make deep cuts to essential public services or raise taxes to balance their budgets. The automatic sequestration cuts triggered by the tax bill would eliminate all mineral leasing payments to states next year, and those severe cuts would continue for the next nine years. The cuts would also apply to any revenues generated from a proposal authored by Sen. Lisa Murkowski (R-AK) to sell off the coastal plain of the Arctic National Wildlife Refuge for oil drilling. Sen. Murkowski has argued that this proposal, which is attached as a rider to the Senate version of the tax bill, would provide needed revenue to the state of Alaska. Under PAYGO rules, however, the federal government would withhold the state’s revenues from oil drilling in the Arctic Refuge over the next decade. The table at right summarizes the oil, gas, and coal royalty, rentals, and bonus bid payments made to Western states in 2016, which would be at risk under the tax plan. Matt Lee-Ashley is a senior fellow at the Center for American Progress. Jenny Rowland is the research and advocacy manager for Public Lands at the Center. The authors would like to thank Sam Berger, Katherine Downs, Chester Hawkins, and Alex Thornton for their contributions to this column.